Dumbo is a perfectly adequate family film. While that may seem like damning with faint praise, keep in mind that this movie was never considered to be among Disney's 2019 big guns. It fills a niche and does so nicely with a style and approach determined to recall the simple pleasures of the Disney live-action films that have largely become passé in today's era. As Kenneth Branagh did with Cinderella, Tim Burton takes the framework of an earlier animated production and reworks it with real-life actors and a dollop of CGI. Unlike Bill Condon's Beauty and the Beast, this isn't a pure remake of its predecessor. Although Dumbo shares story similarities with the 1941 feature-length cartoon, it is more sophisticated and offers a modern sensibility. It's made with families in mind - the material will resonate with children and parents (thankfully) will be sufficiently engaged not to wish to be elsewhere. Unaccompanied adults, however, may not be quite as enchanted. Unlike Alice in Wonderland, Dumbo isn't stewed in a Burtonesque sauce. The director's imprint is most evident during the film's second half, which transpires in a futuristic amusement park that's part Disneyland and part World's Fair. Burton tones down his dark, creepy tendencies in deference to the target age of the audience. The title character, for example, is E.T.-adorable not something out of Roald Dahl. And, although Burton has surrounded himself with familiar players Michael Keaton, Eva Green, Danny DeVito, and Alan Arkin (and longtime collaborator Danny Elfman composing the music), he limits his trademark weirdness. Die-hard Burton fans may be disappointed by how safe the production is (although his perspective of Disneyland could be seen as subversive... but not by 9-year-olds). 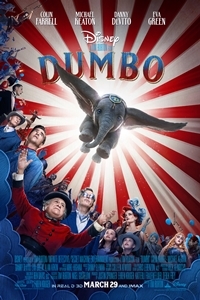 Dumbo opens within the cozy confines of the Medici Brothers Circus, a traveling troupe of misfits and animals that wanders the Post-World War I countryside to provide entertainment to the masses. Two circus children - Milly and Joe Farrier (Nico Parker and Finley Hobbins), who have lost their mother to the 1918 influenza epidemic - are reunited with their war hero father, Holt (Colin Farrell), who has returned from battle with only one arm. Circus owner Max Medici (Danny DeVito) welcomes home the prodigal son but can offer him only one job: elephant wrangler. His newest beast, Jumbo, is about to give birth and he needs someone to care for the little one, who turns out to be a "freak" with long, floppy ears. Disappointed by the baby elephant's appearance and needing money, Max sells Jumbo back to the original owner but keeps the child, dubbed "Dumbo." While caring for the newcomer, Milly and Joe discover something amazing: by flapping his big ears, Dumbo can fly. When Max learns this, he decides to build his big-top show around his new star attraction. Dumbo becomes a nationwide sensation and attracts the attention of impresario V.A. Vandevere (Michael Keaton), who arrives with his acrobatic "discovery," Colette Marchant (Eva Green), to see what it will take to bring Dumbo to his new amusement park. Unlike some of Burton's oddities from past movies, Dumbo is unquestionably cute with photorealism being tweaked to increase the animal's adorability quotient. (He acts more like a dog than an elephant.) Dumbo finds its emotional core by building a friendship between Dumbo and the children. There is also a strong theme about parent/child bonding that has Holt learning how to relate to Milly and Joe; this has a parallel with Dumbo yearning to be reunited with his mother. Burton pays homage to several key elements of the 1941 film including the importance of a "magic feather" and a sequence that reimagines pink elephants. Dumbo becomes the second family film in a month to be set in part inside an amusement park. As in Wonder Park, Dumbo's rides and attractions are more imaginative and awe-inspiring than anything available in the real world (let alone in 1919). We never get a proper tour but the spires of the various park sections provide an effective backdrop for some of the visually interesting scenes. Despite being largely a special effects-creation, Dumbo steals the show. Of the two children, Nico Parker (who has the looks and poise of her mother, Thandie Newton) is the stronger performer. Most of the adults have thankless supporting roles. Dumbo is the first of three Disney animated remakes to arrive in 2019 and, although its source material is the weakest of the bunch, it has followed Cinderella down the path of establishing its own identity. The creative muscles flexed by Burton and screenwriter Ehren Kruger have allowed this version of Dumbo to exist as more than just a fancy live-action retread. Embodying all the "Disney values" parents have come to rely on over the years, Dumbo tells an engaging story about friendship and families with a small side dish of the director's singular vision.